Anyone borrowing money today knows that their credit score is important. 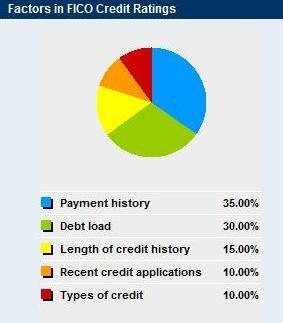 But, how many of us know exactly what goes into computing our credit score. Knowing the factors that make it can help you improve your credit score. Fair Isaac Corporation, the inventors of the FICO credit score which most lenders use to judge us, primarily looks at five factors: your debt payment history, debt load, the length of your credit history, recent applications for loans or credit cards, and the types of credit that you use. Payment History: Fair Isaac Corporation looks at how long past due or delinquent you are in paying your bills, whether you have bankruptcy, judgments, suits, or liens against you, Number of past due items on file, and the number of items in your file that you have paid in accordance with you lender. Debt Load: Credit score companies look at the amount you still owe on your accounts, the number of accounts with balances, and the percentage of your credit line used. Length of Credit History: Fair Isaac Corporation looks at the time that has past since you last open your accounts and the time since the activity on your accounts in order to determine your FICO credit score. Recent Credit Applications: The company also looks at the number of recently opened loan accounts, the number of recent credit score inquiries, and the amount of time since your last recent account openings. Types of Credit: Your FICO score is also determined by the types of credit you use. Credit cars, retail accounts, installment loans, mortgage, and consumer finance accounts are several types of debt accounts associated with your score. Knowing how you credit score is computed can help you increase it. A FICO credit score can range from 300 to 850. The median score is 725, and many lenders consider a score below 660 is a cause for concern. The cost of having a low score can be tens of thousands of dollars in interest payments over the lifetime of the loan. For example, you need 750 or better to get a killer interest rate on a home mortgage these days. A person with a top credit score could expect to pay approximately 6% today for a 30-year fixed-rate mortgage, while someone with a poor score could pay as high as 10% for the same mortgage. When homes costs hundreds of thousands of dollars a one percentage point increase can mean thousands in extra interest payments. It really pays to stay on top of your credit score if you are borrowing large sums of money. You can get your credit score at myFICO.com. There are no tricks or gimmicks that will give your score a quick fix. Companies that try and sell you systems to fix your credit score fast or get a new social security number are gimmicks that will just rip you off…..plus, getting a new social security number for the purpose of erasing your debt is illegal. In the coming week, I’ll talk a little bit about way you can legitimately increase your credit score. Stay tuned. Thank you very much for a wonderful and informative post. I think most people simply fall in to bad credit because they do not know the key to improve their credit score lies in them.